Scharffen Berger's Adventure Contest 2010 Winners couldn't have been awarded at a better time. 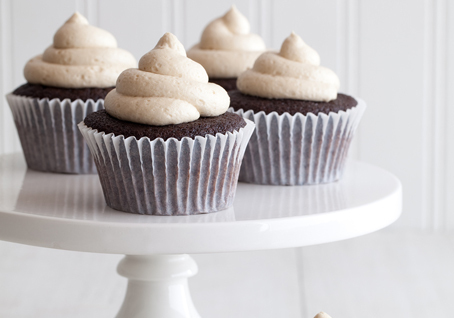 Elaine Barbee from Missouri won the contest for "You Make Me Want to Stout Cupcakes". Perfect for St. Patrick's Day! As part of the contest, bakers were invited to develop an original cupcake recipe using Scharffen Berger chocolate and one or more of 14 “adventure ingredients.” The $10,000 Grand Prize went to “You Make Me Want To Stout” by Elaine Barbee. Her deeply rich chocolate cupcake included stout as the only adventure ingredient, used in four different ways, and was unanimously chosen as the winner among over 2,000 recipe entries. See recipe below. The culinary judging panel included Top Chef: Just Desserts guest judge and award-winning chef Elizabeth Falkner; Scharffen Berger chocolate co-founder John Scharffenberger; chocolate expert and award-winning cookbook author Alice Medrich; award-winning food blogger, photographer and art director Matt Armendariz of MattBites.com; and baking expert and blogger Angie Dudley of Bakerella.com. Cupcakes were judged on creativity, spirit of adventure, ease of preparation, appearance and flavor. For the cupcakes: Line cupcake pans with paper liners and set aside. Sift together the flour, cocoa powder, baking powder, baking soda and salt. Set aside. In a medium saucepan bring the stout up to a simmer on medium heat. Leave the saucepan on the stove and turn off the heat. In a stand mixer or with a hand mixer, cream the butter and sugar. Add the eggs and mix until well combined. Scrape down the sides of the bowl. Set the mixer speed on low and slowly begin pouring in 1 cup of hot stout. Add the dry ingredients to the creamed butter mixture, 1/2 cup at a time, until all of the dry ingredients have been incorporated. With the motor running, pour the remaining cup of hot stout into the batter and mix until just combined. The batter should be thin. Pour the batter into the liners about 2/3 of the way and bake for about 16-18 minutes or until a toothpick comes out clean when inserted into the center of the cupcakes. Poke a hole into the center of each cupcake with end of a wooden spoon and remove the cupcakes from the pans onto a cooling rack. Set aside. For the filling: In a medium saucepan whisk together the cream, stout, eggs, sugar, flour and salt until smooth. Place the pan over medium heat and bring to a slow boil, constantly whisking until the mixture thickens, about 8 to 10 minutes. Remove the pan from the heat and stir in the butter and vanilla until fully incorporated. Allow the mixture to cool slightly before spooning the mixture into the holes of the cupcakes. For the reduction: Place the stout and sugar in a small saucepan, stir and bring to a boil. Once the mixture has come to a boil, reduce the heat to medium-low and simmer for about 15 minutes until the mixture reduces by half. Remove the mixture from the heat and set aside. The reduction will thicken as it cools. For the frosting: Place the butter in a standing mixer or in a bowl using a hand mixer and cream until light and fluffy. Begin adding the sugar to the butter, 1/2 cup at a time until all of the sugar has been used. Scrape down the sides of the bowl. Add 2 tablespoons of cream and the vanilla to the butter mixture and continue beating on medium speed. Slowly pour the reduction into the frosting until fully incorporated and the frosting is light and fluffy. If the frosting is stiff add the remaining tablespoon of cream into the frosting. Scoop the frosting into a piping bag and pipe the frosting onto each cupcake. If using edible stars, place them on the top of the frosting at them time and serve. *Note: If you can't find milk stout this can easily be replaced with creamy stout for the same results. Great post and what a fun giveaway! Janet thanks for posting the article! I made alot of You Make Me Want to Stout cupcakes today with green in the frosting! What better way to have green beer! Janet, thanks so much for posting the article! I made alot of You Make Me Want to Stout cupcakes today with green frosting. What better way to have green beer! How cool, Elaine, love the recipe! Green stout icing. Fab!